Though he is one of America’s beloved humorists, Mark Twain is probably not as well known as a creator of some of the worst revisionist Shakespeare – albeit tongue-in-cheek – ever penned. 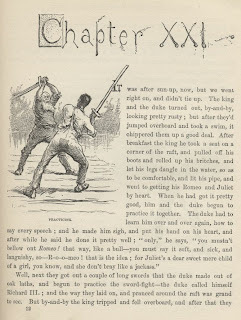 In his novel The Adventures of Huckleberry Finn, published in 1885 in the United States, Twain’s memorable rapscallions the Duke and the Dauphin recreate, blend, and bastardize several of Shakespeare’s plays, including Romeo and Juliet, Hamlet, Richard III, Macbeth, and King Lear. When Huck and Jim encounter the Duke and Dauphin, both men insist they are royalty. The Duke also presents himself as an expert on phrenology, divining, and acting; the last he confirms with a playbill announcing himself as the “world-renowned Shakespearian tragedian, Garrick the Younger, of Drury Lane, London.” He asks the Dauphin if he has “ever trod the playboards” so they can prepare a play to scheme locals out of their money. The Dauphin replies that he “was too small when pap used to have ‘em at the palace” and asks the Duke to “learn” him how to perform Shakespeare. The Duke and Dauphin soon move from practicing the part of the star-crossed lovers, and in addition to the problems with costuming and age, the Duke reveals that the Dauphin cannot seem to voice the part, either: “you mustn't bellow out ROMEO! 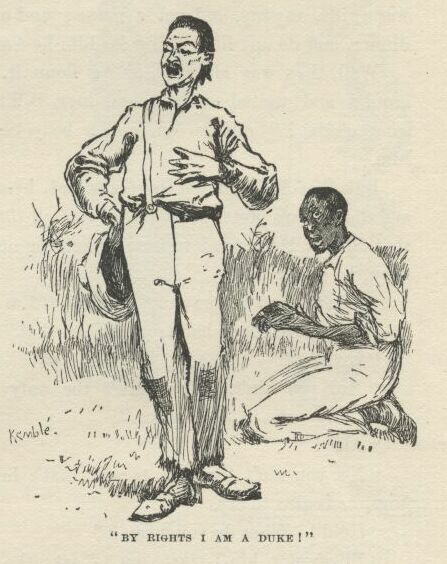 that way, like a bull—you must say it soft and sick and languishy, so—R-o-o-meo! 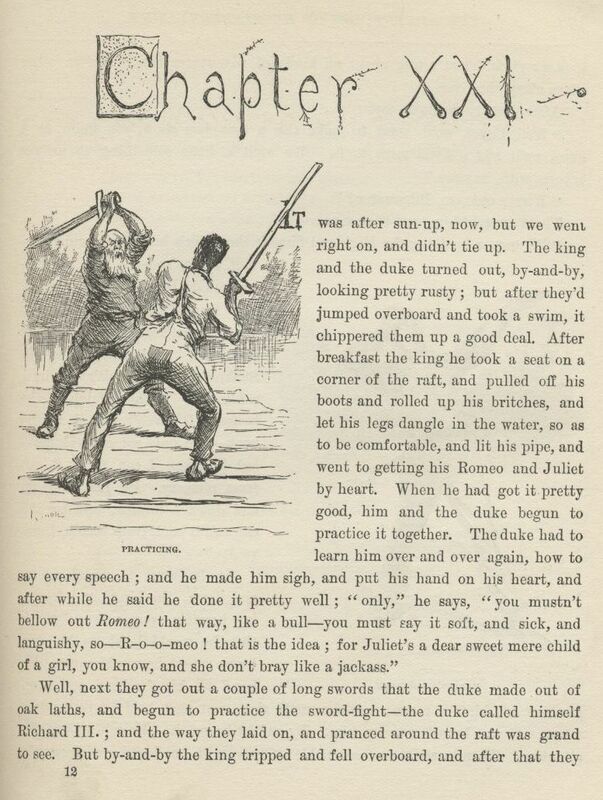 that is the idea; for Juliet's a dear sweet mere child of a girl, you know, and she doesn't bray like a jackass.” Undaunted, the hucksters don “meedyevil armor for Richard III” and practice their swordplay on a raft in the Mississippi until the Dauphin falls into the water. But get thee to a nunnery--go! Clearly, the Duke has had little-to-no actual theatrical training, and he doesn’t even remember Hamlet’s instructions about acting. 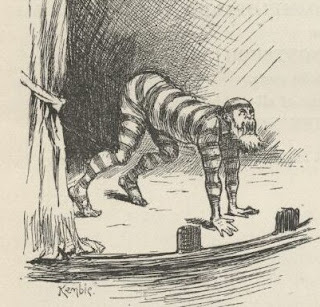 After Twain builds up the upcoming swindle/performance, the scene still manages to surprise the reader. The Dauphin takes the stage, “a-prancing out on all fours, naked; and he was painted all over, ring-streaked-and-striped, all sorts of colors, as splendid as a rainbow. And—but never mind the rest of his outfit; it was just wild, but it was awful funny. The people most killed themselves laughing; and when the king got done capering and capered off behind the scenes, they roared and clapped and stormed and haw-hawed till he come back and done it over again, and after that they made him do it another time. Well, it would make a cow laugh to see the shines that old idiot cut.” And though the audience is amused, their laughter soon turns to irritation since this prancing scene and one short speech is all the “Shakespeare” they will get to see for their fifty cents. 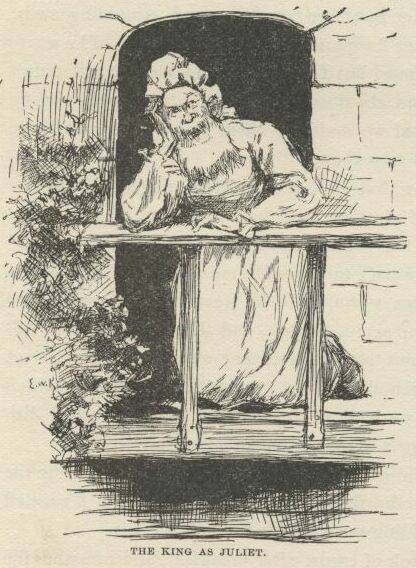 Certainly, Twain has a strong knowledge of Shakespeare to be able to create these humorous scenes. 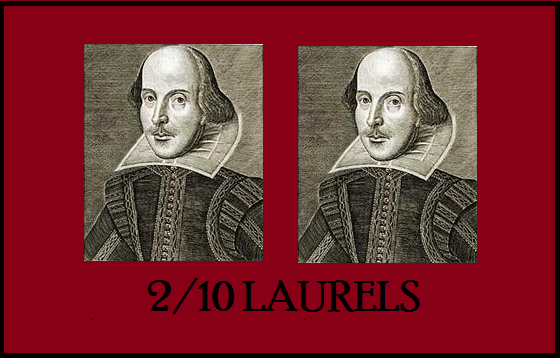 As for the Duke and Dauphin, Bad Shakespeare gives them 2/10 laurels for their efforts. This is probably a shrewd twist on the history of the play, where the role of Juliet was performed by a young man or boy in Shakespeare’s day.